Easily the most influential experience that has informed both my work in educational technology and the way I teach has come from the experiences I had being part of since 2011 as an open participant, teaching in person and online, and building out much of the web infrastructure for DS106, the open Digital Storytelling course community. In 2018, DS106 is still going strong, long after many things like MOOCs peaked and fell into the Gartner trough. There’s not enough blog space to give the full history of DS106; I can make this happen via the power of the humble, and now often neglected, forgotten hypertext link. I’ve been involved since last year with the eCampus Ontario Extend project, providing faculty development as a network across Ontario. I was there helping launch the Northern Cohort last summer and also building out several web sites, using platforms and designs that are evolved directly from those created for DS106. This summer I will be facilitating the Western Cohort who are just starting their program, anyone else interested in Extending with us each day, as well as working with eCampus Ontario on other ideas to keep the Extend momentum going. This blog post of mine is part of the collection of other posts we have curated (yes one of the modules in action) of Ideas from Lead Extenders designed to act as introductions to the Ontario Extend Modules. I’m aiming to address parts of several modules (Teacher for Learning, Curator, Experimenter, Collaborator) in showing how the ideas of DS106 influenced what we built for Ontario Extend. Quite a lot of this, as well as things I use in other projects and my own teaching, traces directly back to DS106, which tells me there is significance to practices started 7+ years ago. And most of these are approaches I have written up and/or developed as templates you can use for your own purposes. Now let’s dive into four of these approaches that Came From DS106. 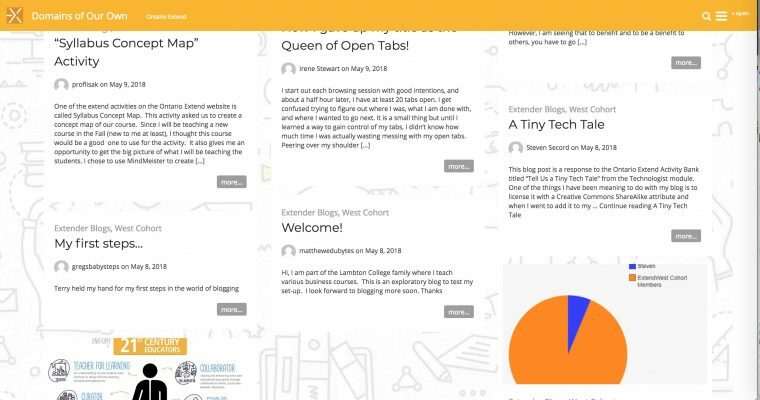 Counter to the more typical centralized housing of instructional material, a foundational part of DS106 was the idea that instead of doing their work in an institutional managed system, participants would write about and share their work in blog sites they managed. 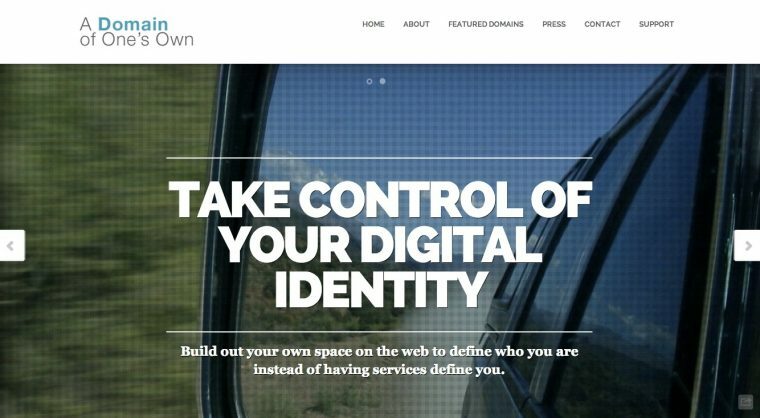 They can choose their platform, as long as it provides an RSS Feed, which enabled them to choose from hosted WordPress, Blogger, tumblr, medium, or what evolved later as Domains of Ones Own, where participants manage their own infrastructure. The Domain of One’s Own metaphor honors Virginia Wolfe’s A Room of One’s Own which established the importance of a place to write as critical for women to create works of fiction. This concept of students producing their work in their own digital space goes back farther than DS106; my first influence was the work Barbara Ganley pioneered in teaching writing back in 2002, where the writings of students in these spaces was “syndicated” back to a mother blog (see an interview I did with The Mother of The Mother Blog). What this means is a distributed structure, both technically and from an instructional standpoint. If I as a student manage my own site where I publish my course work, it clearly belongs to me, it will not disappear (unless I want it to), and I can design and name it any way I prefer (I control how much personal information of mine goes online). At DS106 this has structure been built out in it’s main site, powered by WordPress, with blog syndication via the Feed WordPress plugin. Since 2011 the DS106 site has syndicated over 78,000 blog posts, from maybe 20+ different versions of the course. You can find all of the posts in the firehose we called “the flow” but we are also able to use WordPress’s organizing features to separate out the syndicated posts for different iterations of DS106. This includes, for example, posts from the most recent version of ds106 taught by Martha Burtis or a section I taught as a graduate course for George Mason in 2014 or any of the other iterations listed in the DS106 history. The archiving of these posts is a bonus, the powerful idea is about participants working individually in their own space, but not in isolation, as their posts co-mingle with and are connected to other students. It creates then a potential for serendipity, the networking effect of what Steven Johnson described as the adjacent possible. This distributed participating is the approach we have taken with Ontario Extend; under the front page of the Domains of Our Own site listed under From the Network you will find the “flow” of most recent posts by participants across the project/province. The button links above the flow of posts provide a way to views the posts from the North Cohort, East Cohort, and the newest West Cohort launching this week. You can see for each cohort, or all participants, a list of blogs we are syndicating in. For the project as a whole we have over 277 posts from 54 participant blogs. We have a ways to go, but we are catching up to DS106! Connected learning is when someone is pursuing a personal interest with the support of peers, mentors and caring adults, and in ways that open up opportunities for them. It is a fundamentally different mode of learning than education centered on fixed subjects, one-to-many instruction, and standardized testing. The research is clear. Young people learn best when actively engaged, creating, and solving problems they care about, and supported by peers who appreciate and recognize their accomplishments. Connected learning applies the best of the learning sciences to cutting-edge technologies in a networked world. While connected learning is not new, and does not require technology, new digital and networked technologies expand opportunities to make connected learning accessible to all young people. The “connected” in connected learning is about human connection as well as tapping the power of connected technologies. Rather than see technology as a means toward more efficient and automated forms of education, connected learning puts progressive, experiential, and learner-centered approaches at the center of technology-enhanced learning. In 2014 Digital Media and Learning and Research Hub launched an open course around this concept called Connected Courses. I happened to help them build a DS106-like syndication hub; I have done this for a dozen other courses and projects, but many others have done it as well. For Connected Course I wrote multipart blog post series called Building Connected Courses: Feed WordPress 101. Quite a few educators have followed this to create their own blog hub approach to learning. For those in Ontario Extend interested in this distributed network approach, please get in touch with me. I can coach you through the fine details. I’ve taught nearly all of my courses in this manner, most recently one called Networked Narratives at Kean University; in fact you might notice the theme for that site is quite similar to the Domains of Our Own site. The DS106 Open Assignment Bank may be my most favorite part of the DS206 fleet of sites. There is hardly anything super novel about a collection of assignments, except when you consider the “extras” in the bank that was developed for DS106. 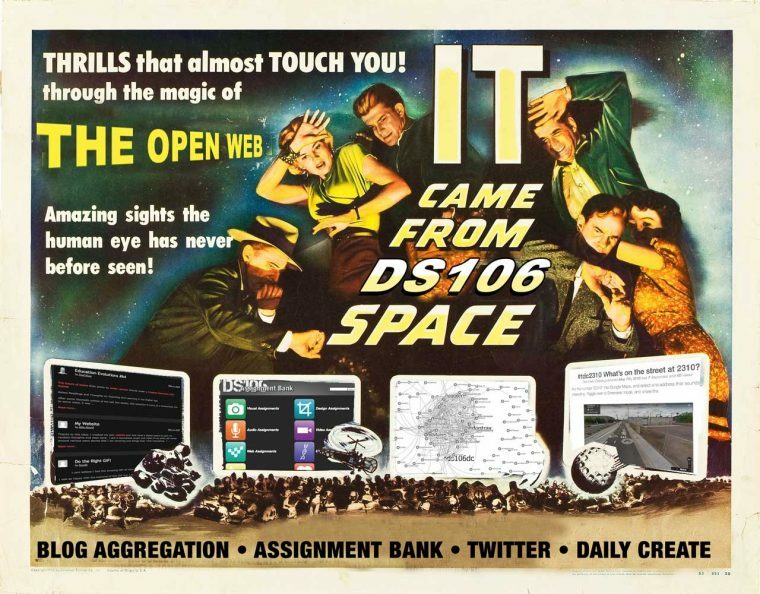 If you like arcane ed-tech history, I researched the origin story of the DS106 Assignment Bank. It’s quite a ride. A principle of DS106 was changing a course from one where everyone did the same assignment the instructor put into a syllabus to an approach where students could choose from a collection of assignments to satisfy the learning of a particular type of media, say to learn audio editing, they could choose to do one or more from the ones available in the bank. If I as a students did not find one I wanted to do… well I as invited to create and add my own. Thus the assignments there were not just authored by the teacher, but other students and participants. 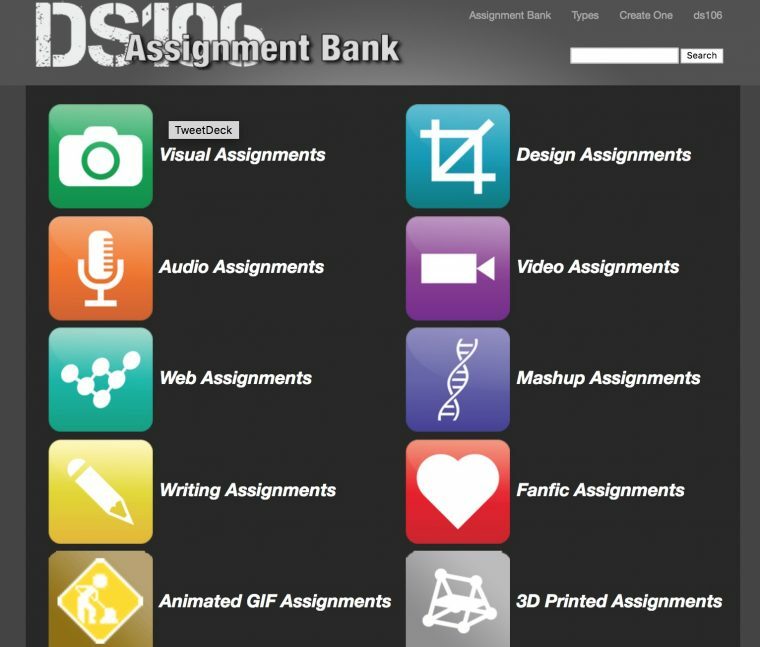 As of this writing, there are over 1130 assignments that have been added to the DS106 Assignment Bank. And on top of that, the site houses over 14,000 responses to the assignments as examples for those who are new to the assignments. Each assignment in the bank has a public, crowdsourced rating (1 to 5 stars for difficulty). As an instructor, I typically might assign all my students one required foundational assignment, but then they could choose among the ones in the site to complete “15 stars worth” of audio assignments. 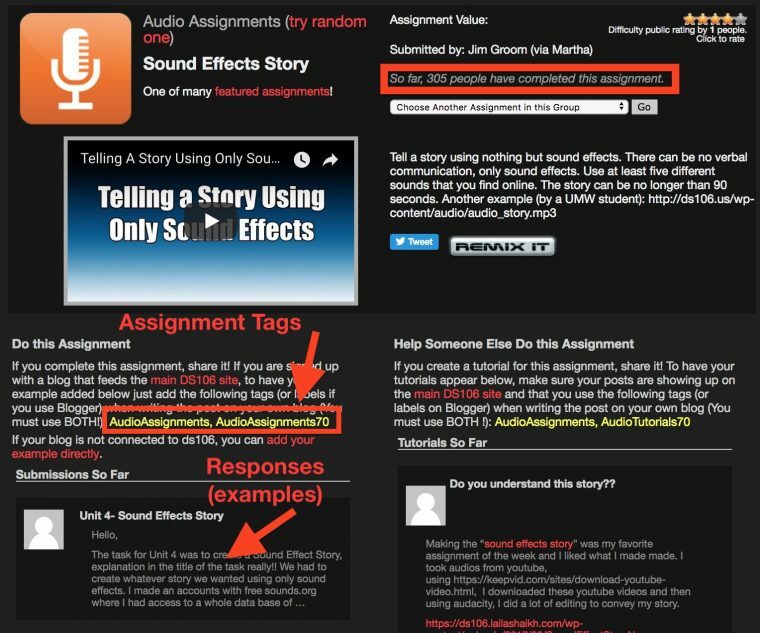 The site is built with the same syndicating infrastructure as the main ds106 site; so if a participants blog is in the main syndication hub, just by using specific tags in their response to an assignment, their response would automatically be added to the assignment as an example for future students. See for example the structure of the Sound Effect Story audio assignment, which has over 300 examples to find inspiration from. This Assignment Bank was developed specifically for DS106, but a few years ago I re-designed it as a WordPress Theme that someone else could install, and configure for their own “bank” of “things” (it need not be assignments) — see some of the other banks built using this approach. One of them is the Ontario Extend Activity Bank. 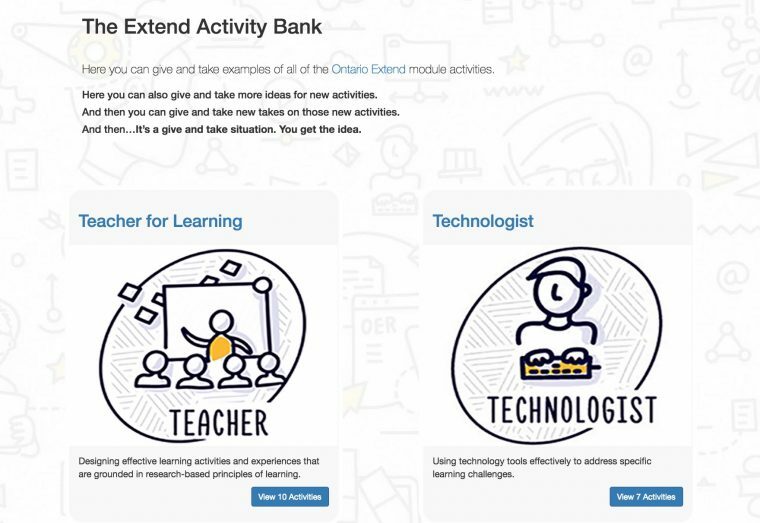 Instead of “assignments” as DS106 offered, this bank offers a choice of activities, organized by the the Ontario Extend modules. As you begin looking at the Teacher for Learning module, you can go to the bank and choose from the 10 activities currently there to explore to satisfy the outcomes of a module. If you think there can be a better or a different activity, you can add a new one too. For this bank, to add your example of work down you can easily enter your response via a web form, linking to where it lives with on your blog or elsewhere. 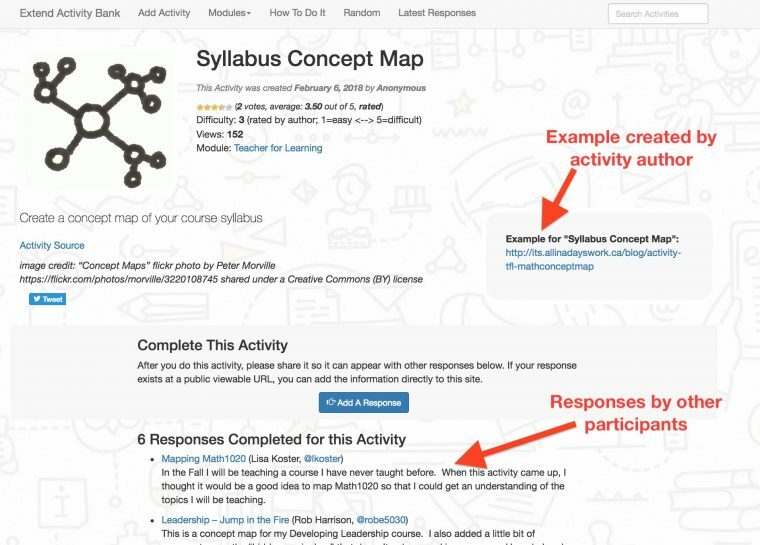 For example if you decide to try the Syllabus Concept Map activity, you will find an example selected by the activity author, plus 6 more created by Extend participants so far. As more people complete activities, the better populated they become with examples for future participants. Because we ask for a twitter name when you submit responses (we never ask you to create an account), the site provides a handy link to show all of your Activity work. See for example Lynn Cartans’s responses “in the bank” https://extend-bank.ecampusontario.ca/exampletags/lynncartan/. I set up a bank in my own Networked Narratives course; in that one it was a collection of “makes”. Again if this teaching approach appeals to you, contact me. 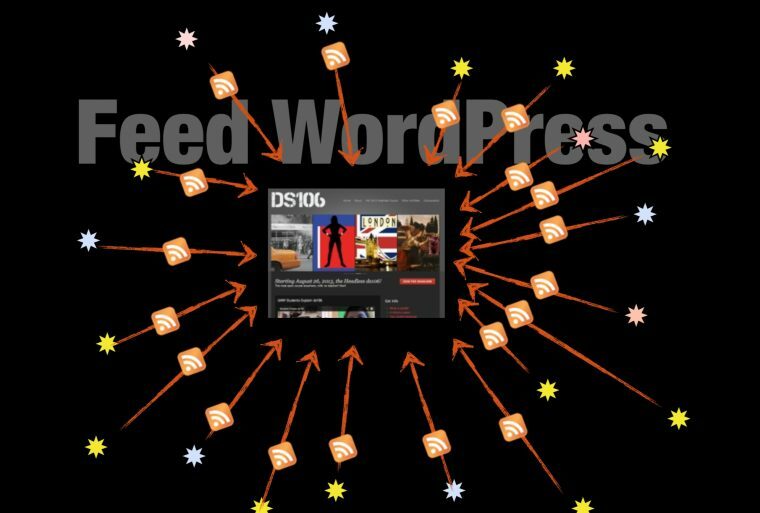 It can be installed as a theme and a few plugins on any self-hosted WordPress Blog. Twitter as an open community networking tool was an essential part of the DS106; we not only started hashtagging as #ds106 and asking people to share there, it really became a place to “rally” around. Like a call sign. It was very critical in creating an open place where people struggling with a concept or a tool could ask for help. As an instructor, open participants and other students usually answered before I even saw the question. It also created a way where people outside of DS106 could get a hint as to what was going on there. We are doing the same in Ontario Extend with a requested #oextend tag for things to share widely, and tweeting to @ontarioextend for specific questions or comments. One of the things I recommend to anyone using a course or project hashtag is to create a Twitter Tags worksheet to archive and provide some analysis of their classes twitter activity. This is a Google Spreadsheet that is infused with scripts, all developed by Martin Hawksey, and available for you to use. 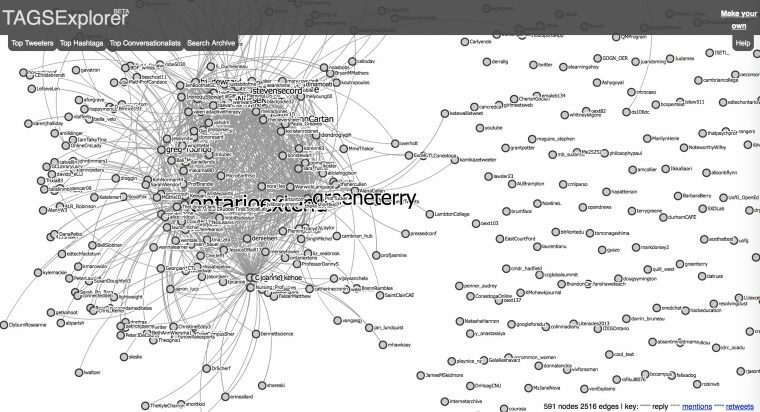 Among the summary stats it provides us (and you) on activity in Ontario Extend, maybe the most fascinating thing is the visualization of the network, the Conversation Explorer, where the size of nodes indicates activity levels of individuals, and the lines represent connections via twitter mentions or retweets. In this visualization our network looks like a rather dense ball of twine or maybe a giant tumbleweed. You can see a denser core of activity surrounded by a halo of perhaps less intensively involved people. It’s nearly impossible to find yourself in there! But we have a tip for you. If you find yourself in the list of All Extenders (or a cohort list), several links will be next to your name. 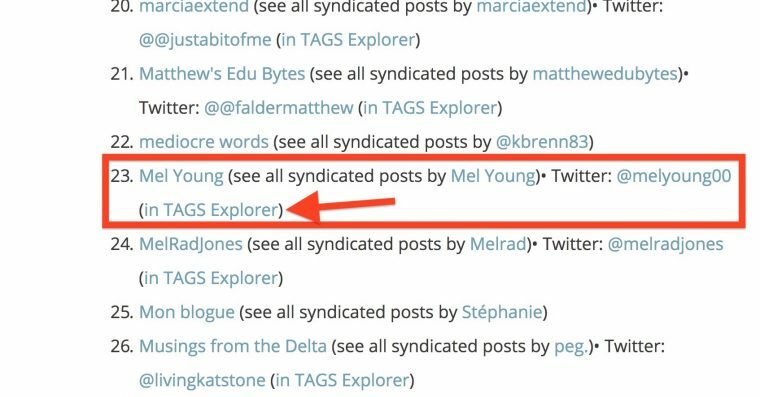 For example, where we find Mel Young listed, the first link is to her Ontario Extend blog. Next, we can see a display of all her posts that have been syndicated to the Domains of Our Own site. Cool, eh? The third link goes to her twitter profile. It will open the Twitter Tags Conversation Explorer for Ontario Extend, but also with Mel’s activity node opened. And then see what happens when you click replay tweets. It might make your draw drop. We hope. So you might see how Terry and I stack up. This my friends, IMHO, is a powerful way for anyone, teacher or student, to interpret and evaluate their participation in a network of learners. You can expect soon a new Activity Bank activity for creating one of these Twitter TAGS spreadsheets for your own hashtags. 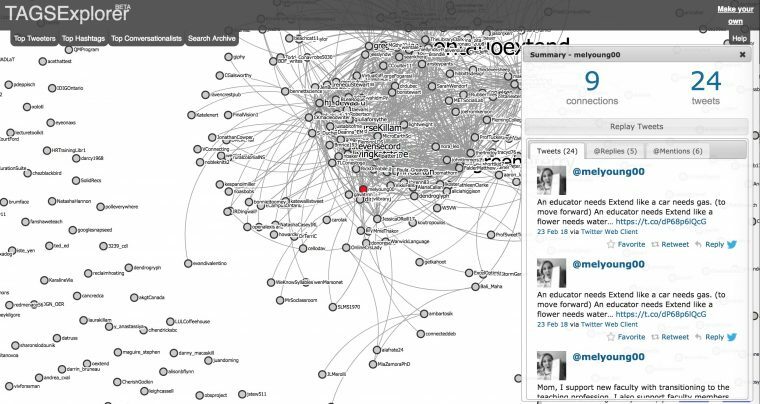 I used this same approach in my Network Narratives course, we have a #netnarr hashtag, Twitter TAGS spreadsheet, and a Twitter community visualization. At mid points and the end of the course, I ask my students to use the data and their activity to include as support when they write a reflective post about their activity. This is much more powerful than asking your students to tweet X times per week. I’ve aleady gushed about the Assignment Bank, but I might claim the favorite thing that has come out of DS106 is the Daily Create. Going non-stop since January 8, 2012, every day the DS106 Daily Create publishes a small creative challenge, The idea is it should be something that should take you no more than 10 or 15 minutes to do. Over 2300 of them have been published in the last 6+ years. These challenges are intended to be somewhat open ended, leaving it to an individual to choose how to respond, to be something that nudges you to try something creative you’ve not done before (e.g. extending your skills), and as something of low stakes so there is low risk of failure. It reinforces the idea that regular practice not only makes you better at something, but also provides a sense of wellness (see a summary of a research study suggesting doing daily photography promotes positive outcomes). Oh, and they ought to be fun. We adopted the Daily Create approach to the Ontario Extend as the Daily Extend. Published each day at 8am Ontario time, each Daily is loosely associated with one of the six modules. To participate, you just respond to @ontarioextend in twitter, include your response as a tweet with maybe a link or a piece of media, and the hashtag for that day’s challenge. Like the assignment bank, we have a leaderboard (as some people are motivated by competition) plus a way for you to suggest a future Daily Extend. I’ve used this kind of site in more than 5 courses and 4 projects and always find a great amount of engagement. It’s very useful as a first twitter experience. And this need not be limited to media and creativity classes, I believe there is a place for a Daily _____ in almost any subject area. That’s why the WordPress theme that powers this site is called The Daily Blank. I ran for for the last two iterations of my Networked Narratives class as The Daily Digital Alchemy. I’m not claiming that all of these together will work for everyone’s course or project. I use them in a mix and match fashion. But they all have a fairly extensive track record (not just by my own uses) and leading back to the DS106 Community. I could write and talk for ages about DS106. These approaches though, are not limited to that one course/community. The only limits are your own wondering. I’m happy to talk on (not endlessly) with any Extenders (or others) about these strategies. They are all, to me, quite Extend-able. 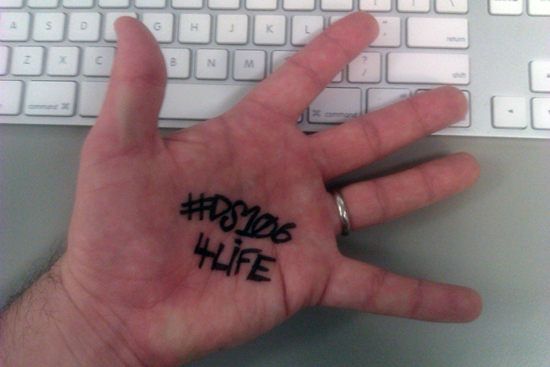 Because, we say in #ds106, it’s more than a class or course, that it’s #4life. “My DS106”, by Rowan Peter in Melbourne Australia, an open participant in DS106 from the start. 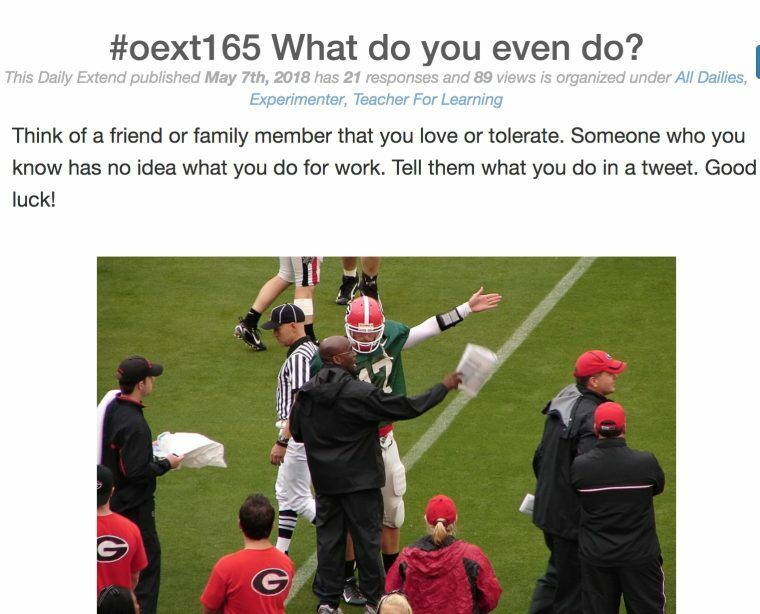 You see, DS106 is like no other course. It starts like any other course, it becomes a preoccupation, and then a never-ending obsession. An obsession to generate creative output every day in public. That’s what DS106 is all about. Image Credits: My remix of a poster for the movie Ut Came From Outer Space, found as an image from Four Color Comics. No kind of licensed or copyright is indicated, which means… it’s copyrighted. I’ll have a weak flag of fair use for the non-commercial purpose of parody and information sharing. Remixing old posters is something that also came right out of DS106, as both a skill, and a way of thinking about media in our culture. If anyone ever needed a course in remixing old posters, I’d love to teach it!